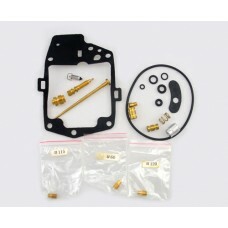 Carburetor repair kit to rebuild one OEM 1976 GL1000 Keihin carburetor model ID 758A and GL1000 Limited 763A. Click to find your carburetor ID. VERIFY YOUR CARB IDS PRIOR TO PLACING YOUR ORDER. ABSOLUTELY NO RETURNS, EXCHANGES OR REFUNDS ALLOWED! Each carb kit contains only those internal application components required to replace impaired interior aperture parts that may be corroded or coated with non-removal fuel additives that are slowing or blocking the normal carburetor interior functions including any necessary internal o-rings, springs and gaskets that are usually replaced in your interior rebuilding project. By Barracuda®. RECOMMENDATION: Kit contains no exterior parts or interior passage plugs that appear on the GL1000 and specifically do not contain manifold connector "O" rings. Joint sealing O-rings, 82-610, are a separate item that we suggest should be replaced when remounting the carbs for a proper manifold vacuum seal. DISCLAIMER: WE MAINTAIN THIS KIT IS ABSOLUTELY CORRECT FOR THE MOTORCYCLE YEAR AND MODEL STATED. WE ASSUME NO RESPONSIBILITY FOR YEAR MISIDENTIFICATION, SWITCHED CARBURETORS OR CARB MODIFICATIONS THAT HAS OCCURRED INFREQUENTLY ON THE ENTIRE GL1000 SERIES FROM 1975 to 1979. ALL SALES FINAL!